Firstly, the Technician will make a visual inspection of the Vaillant ecoTEC plus or pro, Glow-worm or Saunier Duval boiler, checking for good condition and that it complies with current standards. Check that the ventilation is of the correct size and is clear. 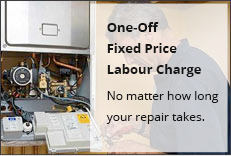 Operate boiler to check for any faults and to see that it is working correctly. Remove boiler casing, clean all inside surfaces and check all main components. Ensure flue terminals are unobstructed, check all seals, internal and external, check flue condition and carry out spillage test (where appropriate). Check gas valve adjustment/setup for correct settings and calibration. Then check operation using a flue gas analyser, where appropriate. Replace boiler heat exchanger door seal, if necessary. Check that the burner flame pattern/colour is correct. Carry out a gas tightness test to ensure there are no leaks. Replace boiler casing, checking that it is correctly fitted and sealed. Finally, the Engineer will operate the boiler again, checking that it is working safely and correctly.